For that extra wow factor at a product launch, sales conference, client event or promotional event, our specialist printing technology means we can print your logo or message directly onto our icing. We can help you design the perfect corporate package. Our professional service gives you the confidence you need to place the order and get on with organising the rest of your campaign. Using the best ingredients possible our cakes are available in the following flavours; Vanilla, Chocolate, Lemon, Orange and Rich Fruit. Please enquire for price/delivery. For that corporate anniversary/birthday we can make a celebration cake to fit the occasion. Please contact to discuss your requirements. Want to attract people to your corporate stand at an event, or as a centerpiece to any buffet. These are available on a display stand or individually boxed/wrapped. Please enquire for price/delivery. Great way to advertise your company at christmas? 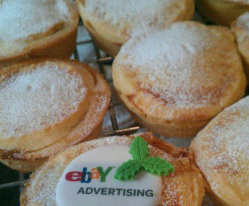 Iced biscuits in either ginger or vanilla flavour decorated with your company logo/picture. These come packaged individually in clear bags to match your event. Do you want to stand out from the crowd? We can create the perfect centerpiece that will certainly be the main attraction. Please call to discuss your requirements.